Today I’m sharing a beautiful outdoor Christmas planter for your front porch. 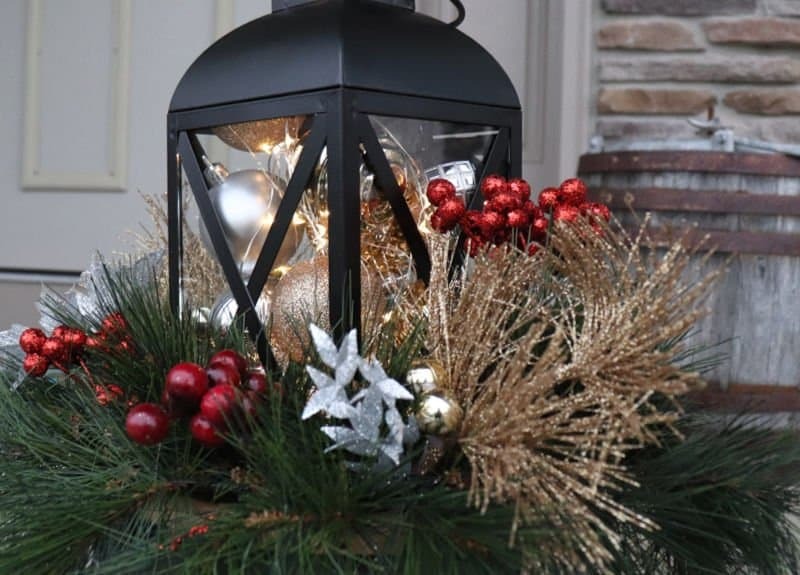 This planter is a lovely way to add greenery, lights and a little sparkle to your porch this season. 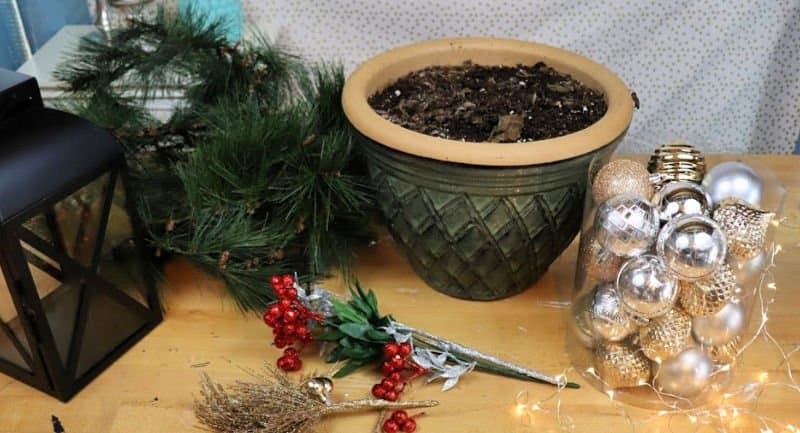 Watch and learn how to make your own and be sure to check out the 20 other outdoor Christmas projects at the end of this post. Outdoor Christmas decorations can be a bit of a challenge here, the timing has to be just right to make it happen. I don’t want to start putting up lights and decorations too soon, but if I wait too long the temps fall and my fingers freeze trying to get all the lights and decor up. This year it looks like the weather will cooperate! I plan on getting everything set up this weekend then flipping on my lights the day after Thanksgiving. Nothing too over the top, some pretty string lights in the trees, wreaths on the windows and some snowflake spotlights on the house. 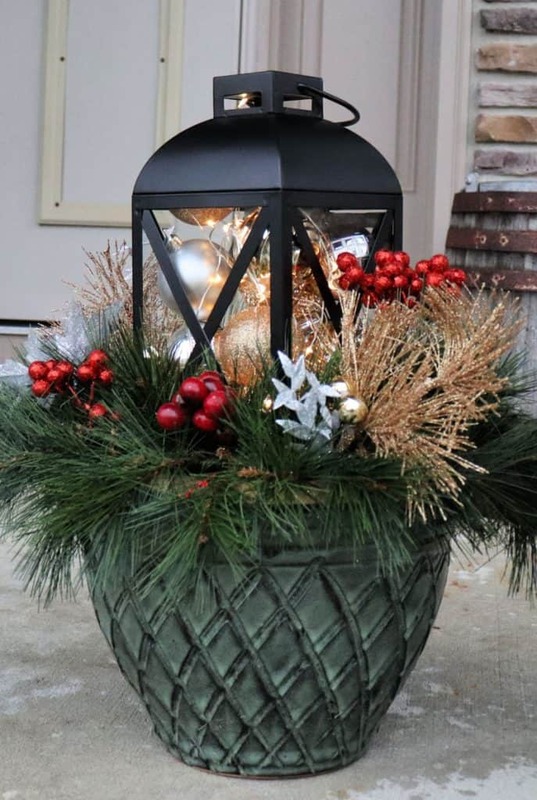 New this year, I am adding this outdoor Christmas planter to my front porch. Fairy lights – get a battery powered set like this one with a remote! Be sure to watch the video for all the details on how to make this outdoor Christmas planter. Start by anchoring one end of the wired garland into the soil, then wrapping the garland around the outside of the pot. To fill the lantern, first add the fairy lights. Be sure to leave the battery pack outside of the lantern so you can access the on/off switch. Then fill the lantern with ornaments, close the door and set it in the planter. Finally, add festive picks to the garland and this planter is ready for the front porch! This Christmas planter is ready to decorate my front porch. If you are looking for more outdoor Christmas decorations, be sure to check out these projects. Such a quick DIY project and the plantar turned out Beautiful. So simple and elegant! I love it! This is so pretty! I love how simple it was to put together! I love love love all of the ornaments inside the little lantern! It turned out so cute! I can totally see a few of these decorating the front porch. Making a few of these! I have everything on hand! What a sweet update for your porch!